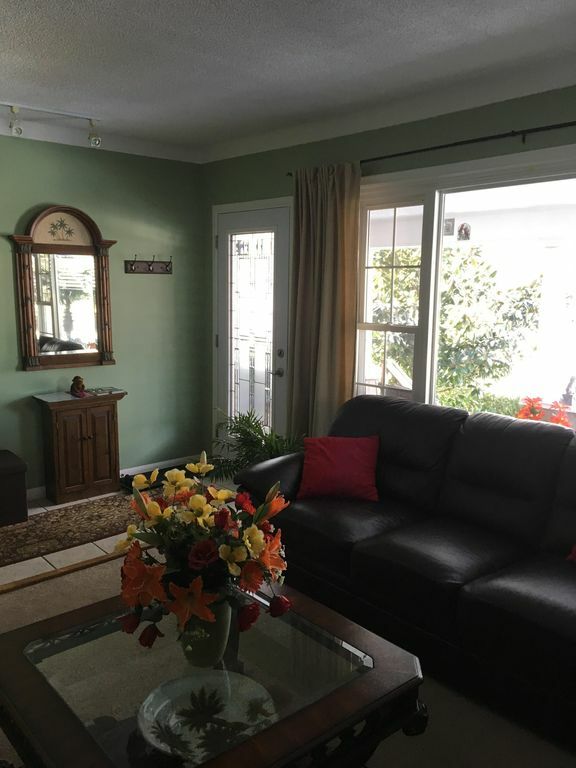 This super clean apt includes a queen size bed, 2 TV's, your own bathroom, two sofas in a living room, front porch on a quiet street and your own private entrance. There is a refrigerator available with free water, breakfast nutrition bar and juice and a microwave. We have been running airbnb for many years and have listed many of the best restaurants (ie. best cheap eats, moderately priced and top end restaurants). We have also listed many of the tourist sights that are often over looked, many of which are free. I am an easy going person that moved from Toronto to Niagara Falls Ontario in 2001. We enjoy all the beauty that Niagara has to offer. I am well versed on what to do and see in the area and can give many tips on the many free things to do in the region. We are very affordable homestay and do not believe in gauging tourist. We are well travelled ourselves and know the value of having a very clean, private and comfortable accommodations. We are steps to all the Niagara Parks attractions. You can walk/bike to the train, bus stations and the restaurants and shops downtown. We had a three night stay at Clinton’s place, the bed was really comfortable and to have those two big leather couches in the lounge was amazing. The perfect place to relax after huge days of walking around. Thank you for your kind review. Wish you all the best and have a safe trip. We would highly recommend you as a guest. It's a cozy and warm place. We enjoyed sitting outside. A place close to main attractions. Gracias! I loved this place! Perfect location, close enough to the Falls, but far enough away from the thick of things. The decor was lovely, I would like whoever decorated this place to give my house a re-do! Super clean, quiet, and the owner thought of everything. I can't express how happy I was to find a mini fridge stocked with beer, soda, water, juice, and snacks after a long drive from Detroit. The juice and water are complimentary, and the other items (beer! yay!) you pay for on an honor system. Very cool. It was chilly when I was there, so the little fireplace was cozy. And you get a spot in the driveway to park, along with Wi-Fi access. I wanted to steal the pillows on the bed (I didn't, haha) because they were sooo perfect, I swear that I had the best night of sleep in forever that night! I can't say enough about this place. I plan to return to the area in September, and I'll rent this place again for sure. We would definitely urge you to give this property a look! Its location is super convenient and only a short drive (2 mins) from all the tourist hotspots. Being right off River Rd, you could even hear rapids from their cute front porch! The property is well kept and has a designated parking spot on the driveway. It comes with a mini fridge and microwave. There's no cooktop or designated kitchen, but that wasn't something we needed. The sofas, as well as the bed, were very comfortable and we found the decor very inviting. We spoke with Clinton upon our arrival and he told us to let him know if we needed anything. He was very sweet and even left us chocolates as a welcome treat! *If you're viewing this property on a mobile, be sure to bring up the full site because you can't see the owners responses to the review. As for the one "bad" review - they definitely had the wrong address. There's no chain-linked fence to be found :) I hope VRBO fixes the inability to see owners' responses soon. Thanks Danielle, you both are welcome anytime. It was a pleasure to have you stay with us and we're glad you enjoyed the sound of the rapids from the porch. To be clear, Homeaway did eventually remove the 'bad' review as the customer didn't actually stay at our property. We thank you for pointing that out and Happy New Year. The trip was ideal for a number of reasons, still, it was acceptionwlly nice because of the access to all the festivities at Niagara Falls. The accomadafions were perfect, excellence use of space, very comfortable, and well designed. Thank you Curtis for the kind words. You are welcome here anytime. We very much enjoyed our stay! It was easy to find and quite close to all the action in Niagara Falls, yet was a nice cozy retreat when the day was done. The suite was spotless and all appears new. Clinton and Robb were friendly, communicative, responsive and helpful. I wouldn't hesitate to stay here again when my travels bring me back! Thank you so much for a wonderful stay. It was our first booking with HomeAway and won't be our last! Joann and Rob were the perfect guests. They left the suite in immaculate condition and were very polite. We highly recommend them as guests and they are welcome always!